These are not your daddy's rally stripes. We use only eye-catching Carbon Fiber, Matte Black, and other custom wraps films for these stripes. Our Rally Stripe Kit fits all cars. 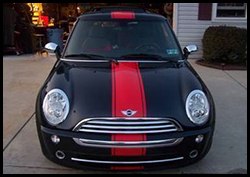 At 6" wide and 30' long, we provide you with enough material to do a dual rally stripe on some cars. All of our specialty films come with a special adhesive system that WILL NOT ALLOW BUBBLES in your stripe. With a faster installation, you will be looking good tonight.